Drama, West Germany/Israel, 2009, 120 min. 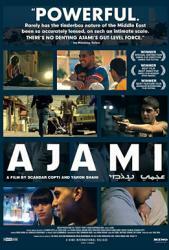 Synopsis Essential viewing for anyone engaged in the ongoing drama of the Middle East, Ajami is a brave, apolitical look at Jews and Arabs in Jaffa’s multi—ethnic Ajami neighborhood — a searing debut by Israeli and Palestinian co—directors, whose balanced perspective and use of non—professional local actors lend a palpable authenticity to a complex, cross—cultural drama. Shakespearian in its scope and themes — revenge, loyalty, hope and despair — the film draws us into the lives of two brothers fearing assassination; a young Palestinian refugee working illegally to cover his mother’s medical expenses; an Israeli woman and her affluent Palestinian boyfriend dreaming of building a life together; and a Jewish cop obsessed with finding his missing brother. Through this dramatic collision of different worlds, we witness the cultural and religious tensions simmering beneath the surface and the tragic consequences of enemies living as neighbors.